When your airbrush gun is running at full speed, you’re ready for anything. Regular cleaning and maintenance is the secret to staying in the flow, especially during busy times like graduation. Between colors: Water works great. Rinse the color cup with water until airbrush runs clear, spraying out excess. Now, you’re ready for a new color. At the end of every day, use airbrush cleaner followed by water for a more thorough cleaning. Make it a regular habit to help prevent future hassles. In order to service your airbrush equipment and help keep your system running smoothly, we offer a simple program to ensure your cake decorating equipment is always in good working condition. 2. If you encounter more stubborn problems, send us the airbrush gun and or associated parts and we will rehabilitate and return your item within four to five weeks. We also offer reconditioned airbrushes in exchange for the same make and model. DecoPac and all other models will be rehabilitated or exchanged for a flat fee of $30.00. If your compressor is not working properly and you cannot resolve the issue, please contact DecoPac directly at 1-800-DECOPAC for further assistance. 1. The manufacturer’s one year warranty is limited to defective parts or workmanship only. The manufacturer’s warranty may be void if general maintenance is not performed or is considered as a normal wear and tear. 2. If it is determined that the airbrush compressor must be returned to the manufacturer for adjustment, we will issue a Fed Ex Call Tag for the return of the compressor as long as it is within the warranty period of one year from the date of the purchase. A copy of the purchased invoice is required to receive the service. The compressor is not under warranty/is not returned in packaging to prevent further damage. We are not able to service the compressor and/or provide a replacement. Below are some common questions about the airbrushes we offer. For more information, fill out our contact form or call one of our DecoPac® Experts at 1-800-DecoPac. 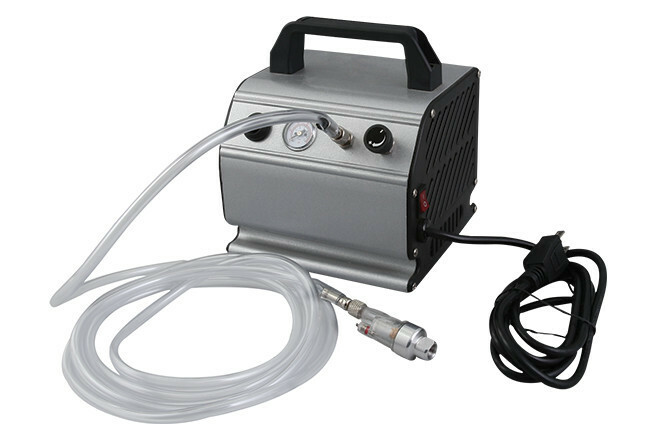 You can also shop all airbrush supplies. Can I submerge my airbrush in water to clean it? No, the airbrush cannot be submerged in water or it will rust. The front two pieces of the airbrush and the needle can be removed and cleaned using hot water or DecoPac CleanAir® solution. Submerging an airbrush voids the warranty. Can I put paste or gel colors in my airbrush? No, only use airbrush colors, no pastes or gels. My airbrush is running but nothing is coming out. What could the problem be? Has it been assembled correctly and are all the pieces present? Is the correct needle in the airbrush? Is it bent or damaged? The needle should be pushed all the way forward and move with the trigger. Use airbrush colors, not gels or pastes. Need help with your airbrush gun or associated parts? Call Customer Service at 1-800-DECOPAC (1-800-332-6722).